PORTABLE POWER FOR YOUR JOB SITE: The EB2000i can operate a wide variety of industrial appliances, making it perfect for portable use on any job site. Take a look at the applications tab for more examples. 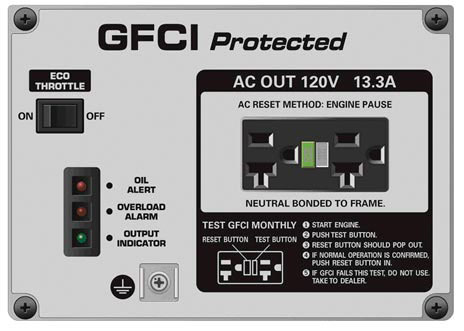 GFCI PROTECTION: The EB2000i has full GFCI protection. 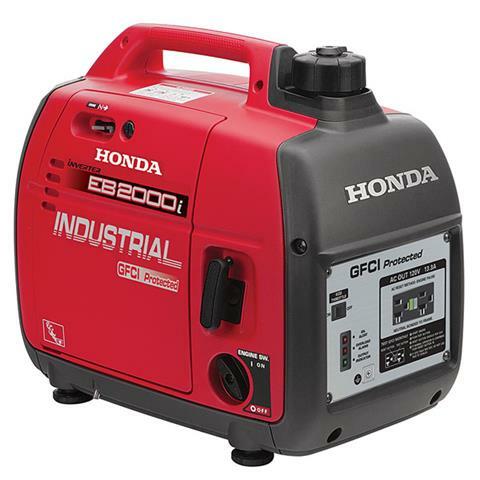 OSHA, LA-ETL, CARB, EPA PHASE III AND USDA COMPLIANT: The EB2000i was designed to meet OSHA requirements, making it ideal for worksite applications. POWERFUL, RELIABLE GX ENGINE: Legendary Honda commercial-grade GX engines are reliable, easy-to-start and incredibly rugged. SUPER QUIET - LESS NOISE THAN NORMAL CONVERSATION: So quiet, you can hardly hear it running. The EB2000i operates at 53 to 59 dBA, which is less noise than a normal conversation. FUEL EFFICIENT - RUNS UP TO 8.1 HRS ON LESS THAN A GALLON OF FUEL: Thanks to our exclusive Eco-Throttle System, the EB2000i offers great fuel efficiency. Runs 3.4 to 8.1 hours on a single tank, depending on the load. HOUR INDICATOR FOR MAINENTENANCE AND SERVICE: A flashing light indicates the generator's hours, letting you know when it's time for service.